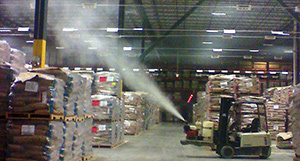 Our large volume industrial fogger, unlike typical units, enables lightning-speed fogging dispersal and distribution. Our proven expertise and customized fumigation and fogging treatments are why recognized clients have been choosing Western since 1928. Western’s certified professionals will work with you every step of the way in planning, scheduling, treating, monitoring and follow up, assuring your peace of mind. Our AIB and HACCP certified experts will tailor a solution to fit your needs. You can count on our extensive knowledge of quality and safety standards. Western is proud of our long history of delivering successful results and can provide references from many satisfied customers. Contact us for a consultation.